We’ve all heard, seen (and possibly written) the meme’s that have heralded the death of cartography, the death of the printed map and so forth but these slow-news-month scare stories couldn’t be further from the truth. More maps are made by more people than ever before and if anyone is worrying that print mapping is dead then Mapbox might just have precipitated the second coming with their new printing capabilities. The irony. The number of books on maps published in the last year has also rocketed and someone you know was likely spoilt for choice when choosing their 2014 Christmas gift for a map-nerd son or daughter. Plenty of delicious coffee-table books full of great maps are currently available (see Jonathan Crowe’s review to which I’d add the NACIS Atlas of Design and James Cheshire and Oliver Uberti’s superb The Information Capital as two of my recent favourites). 2015 looks set to bring more of everything to our browsers, our desktops and our bookshelves. The appetite for maps has never been greater and sure, we see a lot of cartographic crud that we have to wade through but in some senses it makes the gems even more special when you find them. Map-making and the interest in maps, then, is in rude health…but what of cartography? We rarely see mention of ‘cartography’. Cartography is defined as the discipline dealing with the art, science and technology of making and using maps. The International Cartographic Association (ICA) has recently been accepted as a full member of the International Council for Science (ICSU) which is the international non-governmental organization devoted to international cooperation in the advancement of science. Cartography just graduated but I find that the term and what it stands for remain a term of derision for many. My feeling is we need to re-establish cartography as modern and relevant, because it is. There’s no doubt cartography has undergone significant change in the last decade and a number of people have claimed we’d be better off if we just forgot about ‘cartography’ as a definition or as a framework to talk about mapping. Change is nothing new in the mapping sciences because evolution has always radically alter the mechanisms of map-making from time to time. This is usually a technological change (engraving, lithography, computers, cellphones, Google…) which has a massive impact on both the design and production of maps and also the people involved in map-making. New people enter the mapping landscape which both challenges and reinvigorates but it usually goes hand-in-hand with cartographer’s moaning because it usually means they have to retrain, reinvent or let go of ageing techniques. Feeling threatened or at least a little frustrated by change is inevitable if your skills and experience are overtaken so frequently by the new kids on the block. It’s tiring to perpetually invest the energy to keep pace; and also to face the challenge of people trying to constantly rename what it is you do. Cartography is a word that many new to map-making seem reluctant to use. Not so long ago, up stepped the self-proclaimed ‘neo-cartographers’ whose moniker describes the people and processes of making a map outside of the community of professional map-makers. That’s everyone right? I’ve written about my views of neo-cartography being a fallacy before but don’t we already have a definition that’s relevant? It’s called ‘amateurism’; and before you baulk and rip me to shreds I say that not in a derogatory sense but merely as a perfectly good differentiator. An ‘amateur’ is a person attached to a particular pursuit, study or science in a non-professional way. Amateurs may have little professional training. Many are self-taught. The negative connotations of amateurism mean that sub-par work is often easily explained but that’s also broadly true as most of the time a non-professional will not be able to produce work to the same standard as a professional. So why do we constantly need new terms to describe making and using maps when the word cartography, whether it’s as a professional or amateur pursuit, seems to fit? It’s perfectly acceptable to have professional and amateur cartographers making maps. Many of the best maps were made by amateur cartographers anyway. New terminology tends to be sought to describe a movement that wants to be seen as different from the past. New. Fresh. Exciting. Maybe being unencumbered by the perceived shackles of formal training is what defines a neo-spirit but they’re just bringing different skills and new insight to bear to cartography which is no bad thing. The open source movement, Volunteered Geographic Information and Citizen Science have been the backbone of the rise of ‘neo’ because computer scientists and programmers need to have something to programme and geographical data (and lots of it) has coordinates which lend themselves very well to computer processing, particularly if there are other numbers attached to these coordinates. Coders saw geo as a vast untapped marketplace and jumped on the mapping bandwagon…partly because cartography and professional cartographers were too slow to grasp the mettle. There’s a lot of positive work that these ‘amateur cartographers’ (and professional computer scientists) have brought to bear and I don’t disagree that formal definitions of cartography don’t need challenging. But I do take issue with the creation of a new species called neo-cartographer (or whatever) because it seems to go hand-in-hand with decrying what’s gone before while at the same time hyphenating the label to bring a sense of stature to their own efforts. They are fledgling cartographers whether they like it or not, albeit not necessarily in the sense of what has gone before. Rather than embrace cartography they prefer to distance themselves and even become vocal in their anti-cartographic sentiment because for some reason they know best. I got into a brief twitter exchange recently because a ‘designer’ had stood up at a small conference gathering and proclaimed they were a designer and that meant they need not talk with a cartographer because they wouldn’t have anything to add that they couldn’t already better. That arrogance and derision is quite common. My retort was simple…everything is designed and cartographers design maps; so what’s the domain specialism of a generic ‘designer’? Truth is, if the designer had collaborated with a cartographer the map product would likely be far better than sum of the parts anyway. Same goes for your average coder…in fact the same goes for probably 99% of amateur cartographers. This issue with the word cartography goes deeper. This is about people’s perceptions and misconceptions of what cartography is and what a cartographer does. Of course, the term cartography isn’t as old as map-making anyway and so the claim that it’s the defining framework for mapping can be plausibly challenged. The term cartography is modern, loaned into English from the French ‘cartographie’ in the 1840s, based on Middle Latin carta "map". While relatively new, it has nevertheless become synonymous with the definition of the art and science of making and using maps. It helps to define a discipline (and now an official science). Yet the public perception of cartography is also awash with a lack of understanding of what a cartographer does. To many, cartographers just make maps ‘pretty’. They are more concerned with finessing the aesthetics of the map than the need to make the damn thing and publish it. Maybe that perception bears fruit in some instances but it’s a gross generalization and most professional cartographers I know take a healthy approach to the graphical marriage of form and function. And these misconceptions can get quite alarming. I recently had a conversation at Border Control at Los Angeles International airport where the Officer (wearing the obligatory hand-gun and devoid of humour) asked my occupation. I often say something nebulous that will get me through unscathed but increasingly I feel I should just say it as it is so I said ‘cartographer’ when asked my occupation (curiously, despite the fact I have never had the term ‘cartographer’ as part of any job title). Stunned silence ensued and the Officer eventually asked ‘what part of the cars do you fix?’. My British sense of humour wanted to say any number of things but the lack of humour and obligatory hand gun made me pause and simply reply that I made maps. The Officer retorted that she never knew that; so we had a brief conversation about how her map gets on her cellphone and yes, that there are places that still need mapping. After I’d been processed I wished her a pleasant day as I wandered through and pondered on the fact that her impression is probably quite common…and it’s really not that far removed from people’s knowledge and understanding of cartography in the geo and mapping industries themselves. I’m serious. The number of people I know who work in the geo industries who wouldn’t know a decent map if it reared up and bit them on the arse is staggering. Sometimes they make maps. Sometimes they market or herald maps made by others. Mostly they just carry on in their own ignorant way satisfied that their own facts are perfectly OK…and get annoyed if people point out deficiencies. I also recall reading the jacket notes of a book on cartography, published in 2009, that claimed they wrote it because no other books on cartography existed. That’s a blatant lie. Just because you didn’t look very far doesn’t make it a fact. And there’s the problem…people prefer their own facts rather than making the effort to learn those that have already been proven or written. So these negative connotations about cartography begin to blur into personal facts by people predisposed to that argument and view of identity. So if you’re a coder, journalist or designer (or anyone new to making maps) and you make maps as part of your work…you’re involving yourself in cartography, but you likely never call yourself a cartographer because of those connotations and perceptions. If you’re going to play in the same sand-pit as other cartographers I propose it would help rekindle respect for the discipline, rather than perpetuate divisions, if you learnt a bit about what being a cartographer is really all about. I don’t propose you take a class because you’ve done that already to become an expert in your own field but appreciate that some have taken classes in cartography and that makes them experts in that field. We can’t all be experts in everything and with such crossover between job requirements these days we inevitably need to tool ourselves in ways that make us amateurs in some things while professional in others. The sweeping technological changes and turnover of people at the forefront of cartography means change takes place almost as regularly as fashion but like fashion, most new is actually old and reinvented for a new audience who are simply arriving at their map-making using a different approach. The rise of open this and that has brought this new set of people to the light table who use spatial data as a way to flex their computing muscles or to tell their data-led stories. Modern browsers, new programming languages, SDKs, APIs, open geospatial data and the freedom of the internet created the perfect storm and there were many storm chasers just waiting to jump into the mapping milieu. I recently compared the internet to Mos Eisley spaceport from Star Wars (Episode IV) and the famous Obi-Wan quote “Mos Eisley spaceport. You will never find a more wretched hive of scum and villainy. We must be cautious.” It’s true. The internet has brought wonders but also troubled times for cartography because it has largely tried to denounce it (mostly with terrible maps it must be said). The neos got their mapping hands dirty but also made cartography a little grubby in their dismissal of much that had gone before. The mindset of many of these amateurs has sullied cartography because the quality of the result rarely matters even though there’s been some beautifully disruptive gems amongst the general mess that’s been created. But here’s the sting…the more these amateurs work with maps, the more their work matures and the less they remain amateurs – they become part of the profession through practice and experience. No one ever said you have to have qualifications to be a professional. On-the-job experience counts for a lot if you’re willing to learn, develop and develop knowledge and understanding to go along with your experience. Because change is inevitable (and why should we stop anyone from having a go or getting involved in map-making anyway? ), it’s beholden on cartographers and those geospatial experts who know something about high quality, meaningful mapping and data visualization to accept change because it’s part of the territory. It’s not particularly unique to cartography either so the idea that we get a raw deal is perhaps simply part of a stereotypical view of reality. The fact is, change happens and it happens rapidly. Becoming part of the change, being the change you want and working to ensure the fundamental basis of cartography is retained is vitally important. If we leave cartography to the amateurs we’re running the risk of leaving behind all the good stuff for short-term gain, reinvented techniques and an approach that tends to prefer butting heads with convention rather than embracing it and making good use of it. I’m simplifying and generalizing of course (it’s what cartographers do) but the brain and skill drain is palpable in much of what we see in cartography. Academic programmes are largely gone or where they do exist they’re seen as too theoretical and not practical enough (by neos) or are too far down the buttonology road to be considered ‘proper’ courses (by academic cartographers). National Mapping Agencies have had to rapidly alter their course to take advantage of new approaches. Maps are now personalized and mostly we default to the ubiquitous offerings on our desktops or mobile devices…and we consume transient maps about this whimsical topic or that fanciful theme daily. And cartographers still moan. We’ve got to get with it as much as we want our new map-making friends to get with it. Embrace change but work to promote what cartography is, how it can be inclusive, not exclusive and what knowledge and skills one might reasonably expect a cartographer to possess as they develop from amateur to professional. That may render some people as perpetual amateurs but that shouldn’t be negative. We are all amateurs at something or other (sport, cooking, writing…). The point of Flowers’ list is to try and debunk what a User Experience expert is, what their skillset and expertise is and what roles they are able to fill. 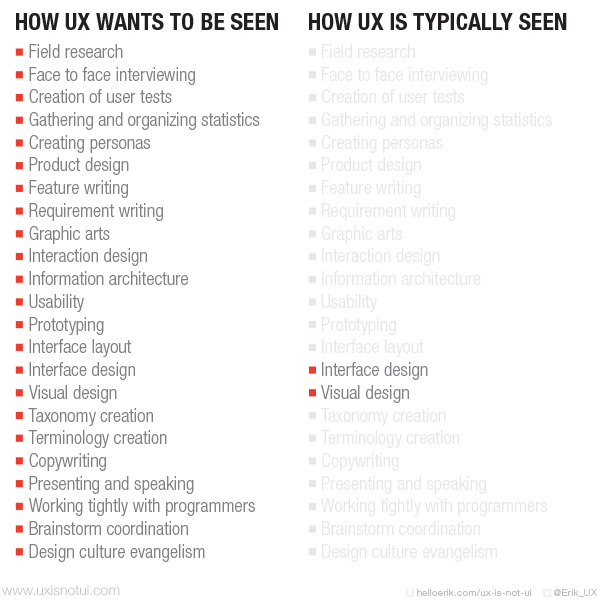 Some are entire jobs or careers and some are perhaps a little more transient but what he wants you to realize is that UX designers are not just people who do UI design or who think the world can be solved through UI design. He wants you to appreciate that there is much more to being a UX expert than many might immediately think. So I made a similar list for cartography and the sort of expertise and roles cartographers are involved in. Before you claim that not every professional cartographer wants to be seen like this let me be clear…I agree. 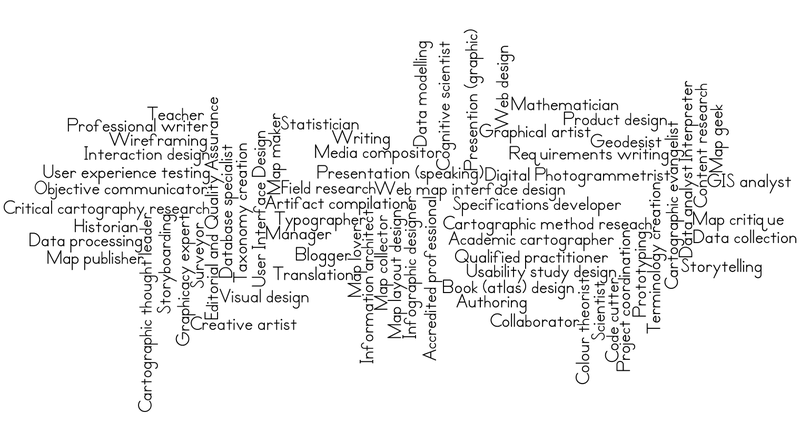 The list is of expertise and skills that cartographers will possess in different combinations and to different levels. Possibly not every cartographer can claim they are proficient in every part of this list (actually, I’d be wary of any that do) but it shows the breadth and depth of the cartographic profession. And on the other hand, the following version of the same list is generally the way in which cartographers tend to be viewed: as an ill-defined, nebulous group of grumpy people who tend to just make maps and complain about everyone else’s maps, note the perception of this has also seen a subtle change from the word critique (constructive, supportive, rigorous and justified) to Police (simply critical). And yeah…it’s in Comic Sans. This is an unfortunate situation but I’d challenge anyone within the cartographic community to refute that this is how many others look at us and what we do. It’s no wonder people claim all we do is colour in with computers (a phrase my old Dean of Faculty used in describing the geo, GIS and cartography courses at Kingston University…he’s risen to Senior Deputy Vice-Chancellor while GIS and geo have all but closed…terrible sign of the times). But these sort of narrow-minded people never seem to really understand or want to understand what it is that a cartographer brings to the table. In fact, you’ll see this lack of understanding permeate across job adverts and specifications and even within organisations that should know better. Whose fault is this though? Well I began this by complaining that cartographers simply complain and in many respects I feel that as a community we have largely been the architects of this perception. Where once cartographers were Royal appointments they are now backroom staff and, to be frank, you’re likely to need to be a coder or something else first and foremost and an amateur cartographer second. 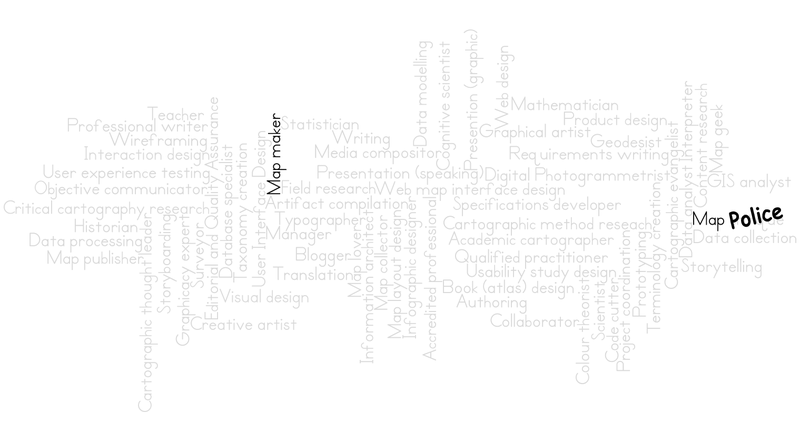 The ability to know how to make a map is tangential to many other job requirements. It’s also the case that when you make a map many employers wouldn’t know the difference between a good and poor map anyway. Quality is low on the list of priorities for many. Speed and turnover is more useful. And so the path to the dark side is complete as apprentice becomes the master. A new order is formed that eschews the past and leads to the rise of an alternative with a new mindset. Yes, I’m using a Star Wars analogy again which even had those on the good side like Han Solo mocking the Jedi: “Hokey religions and ancient weapons are no match for a good blaster at your side, kid.” Trouble is…actually, most people side with the Jedi in Star Wars and ultimately appreciate it. Good triumphs evil. Just like the Jedi, cartography gets bashed about a fair bit from time to time but it needs to reinvigorate, return and prevail as the way in which we set out the cartographic order in our universe. My point is simple (despite the lengthy essay)…whether we call it cartography or not (and we should call it cartography), cartographers have much to offer. They are rarely seen as people that have such a varied skillset as I’ve set out here but I would encourage us to shift our thinking. Being a cartographer is a fine profession. What needs to happen is to explain far better to people what we do. We need to go beyond simply saying ‘I make maps’ because that reinforces the stereotypes. We need to avoid infighting between those who prefer to print their maps and those who prefer to code. We need to accept that some make maps using GIS software and some use Illustrator and Photoshop. You know what…some people use a wide range of approaches and I have Esri software, Adobe products, QGIS and Tilemill installed on my computer. I use ArcGIS a lot (inevitably, I’m paid to…though in the past this has been by choice also). I also have Mapbox and CartoDB accounts. It’s allowed. Beyond the different ways in which we approach the craft, we can start re-establishing cartography by encouraging people inside and out to acknowledge the expertise a cartographer can offer and see them as vital in an organizational context. ICA are making efforts to underpin this with the designation (by the United Nations Committee of Experts on Global Geospatial Information Management) of 2015-2016 as International Map Year which is formally launched at the 27th International Cartographic Conference in Rio de Janeiro in August. My good friend, current ICA President Georg Gartner has also written in a similar vein recently on The Relevance of Cartography and Challenges to Cartography. As cartographic professionals, we all need to help develop a better public image; one that encourages amateur cartographers to see themselves as such (or as working towards becoming professional) and that allows people more generally to understand how the map on their mobile phone arrived there. It’s not magic. It’s cartography. It's a great word so let's embrace it. Postscript: I'm no longer Editor of The Cartographic Journal after a 9 year stint but if I were...this would be the first Editorial of 2015. Postscript 2: Well done if you got to the end. I hope it's provoked some thinking.